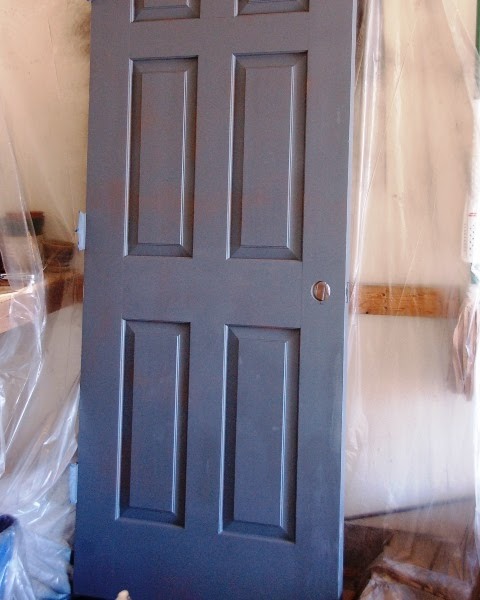 Surprise, I painted the door! See how on task I am? Yesterday morning my sweet husband took the door off the hinges for me and helped me carry it into the garage (it must weigh about 700 pounds) so I could work my magic. 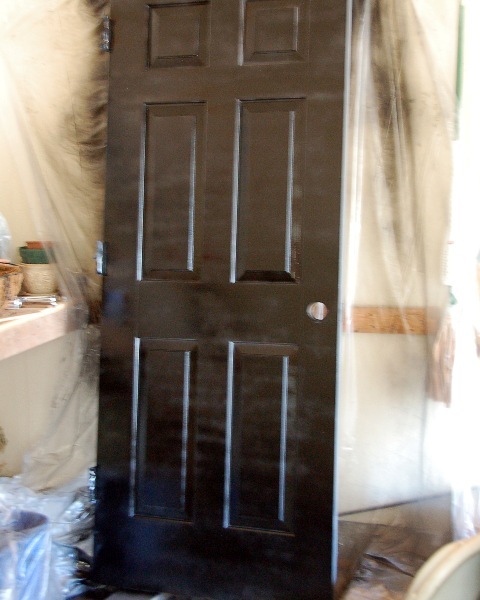 I decided to use spray paint, since it was just a basic black semi-gloss paint and I didn't want the hassle of a roller and a brush (which are both necessary when I paint these paneled doors). 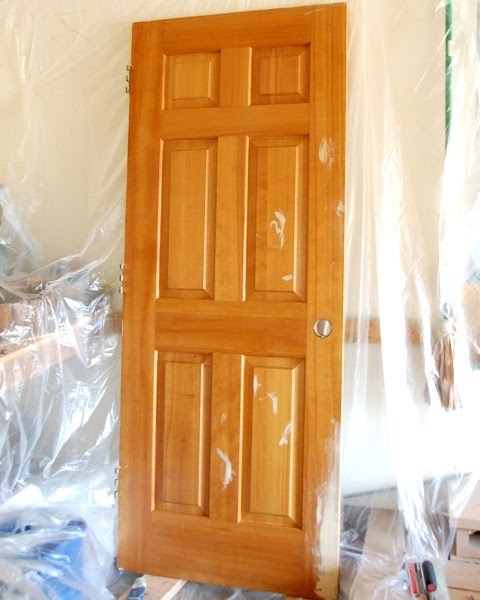 Come back tomorrow for some tips and tricks for working with wood putty, especially over large flat surfaces (like a door or a flat post or leg on a piece of furniture). ...and then I started painting. You've heard it a million times, but several thin coats is the way to go. You might be able to see in the above photo that I worked my way back and forth like a typewriter, always keeping the spray paint can moving and going past the edge of the door before I changed directions. This helps eliminate spots that receive more paint and end up looking like glossy blotches in the finished surface; this technique is especially important for higher gloss paints (in my experience). If you want an even finish you need to be mindful of how you paint. I replaced the old doorknob with a satin nickel one we had sitting around, but I needed to address the brass hinges. I didn't want to buy new ones, so I decided to paint them too. 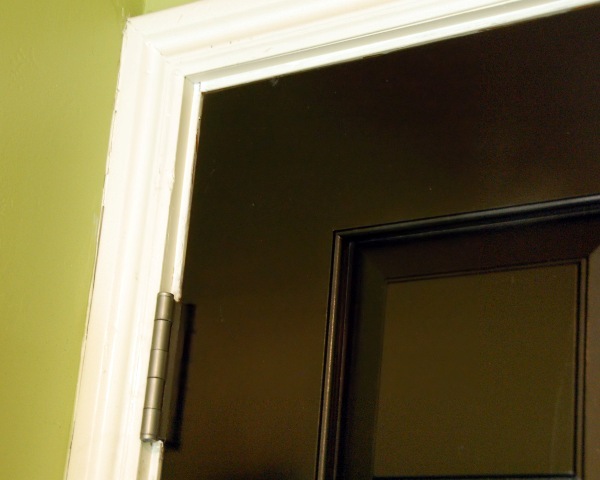 And while there are some great tutorials out there for painting doorknobs, I wasn't as concerned with these hinges since they won't be handled constantly like a knob. 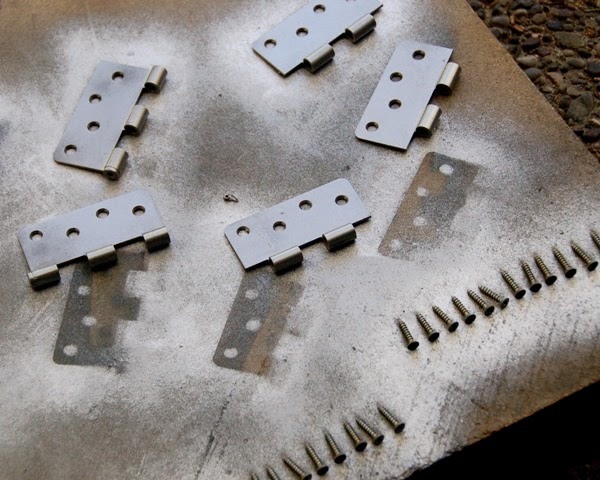 I started by using a hosuehold cleaner to remove as much dirt and oil as possible. 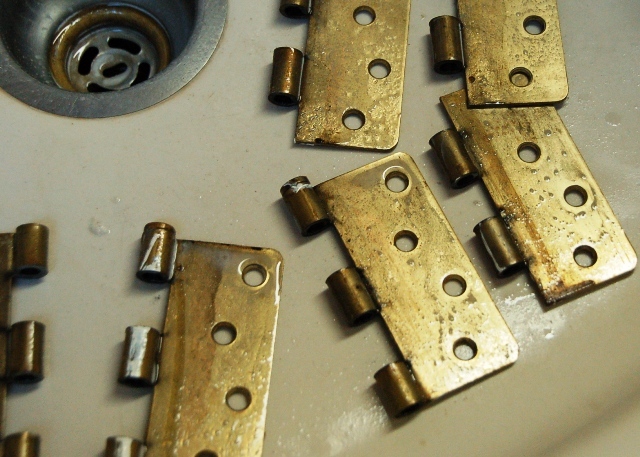 Then I sprayed them with primer and followed it with a metallic spray paint and then a clear coat in a satin finish. Late last night Mike and I hung the door, and I think it turned out fabulously... but this sneak is all you get right now! I really am going to finish the entire garage entry area and unveil it in a dramatic fashion as is only fitting, considering my melodramatic streak. Black doors are the way to go. I like the hinge color as well. What a small price for such a big WoW factor!